Andy Hampsten has always been one of my favorite riders. And Rapha somehow knew that, so they made this video for me. Or something like that. And he also rides bikes like this, which as anyone who knows me will tell you, pushes a lot of my buttons. 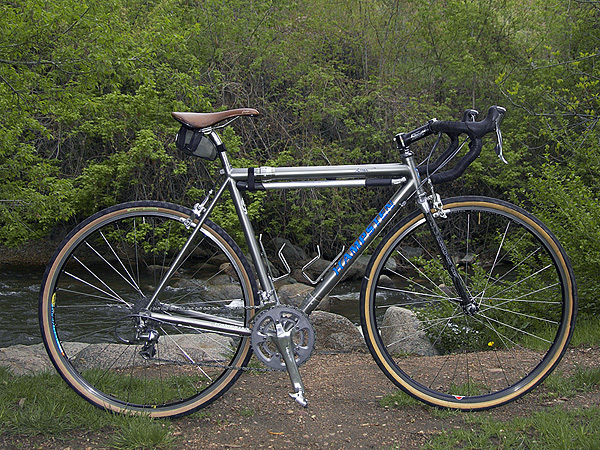 S&S coupled titanium frame with a carbon fork, 33.3mm tires, King hubs, Dura-Ace bits, and all sorts of other good things. It’s clearly a bike that’s meant for riding anywhere and everywhere. Check out the rest of the gallery for the details.